When your conveyor motor stops working, do you know what you need to quickly replace it? How do you even know what the original motor was rated? Cisco-Eagle is a premier Hytrol distributor and can help you find precisely the right number for your conveyor. Contacting us is the easiest way. We will typically need the Hytrol FO number or Serial number to get started. Hytrol’s serial numbers are provided with each conveyor. Now we’re getting somewhere. You can just look at the nameplate on the old motor and then re-order that same model. But what do all those bits of information mean? Is there a way to get a more efficient motor when you choose a replacement? Which nameplate info is the most important if you can’t find a motor with all the same characteristics? Each item included on the nameplate tells you about the capacities and performance you can expect from that motor. Understanding motor standards will help you make better choices when replacing a motor. This is often the best information you can have – you simply order the exact same model as that given here. If that model is no longer available, or you want to see if you can improve on the efficiency of the equipment, you will need to rely on more information on the nameplate. This is the number the motor was given during its assembly. Serial numbers can be used to track down the manufacturer, repair parts, and other information about that particular motor. If you think the motor may be under warranty, the serial number becomes extremely important. The motor you choose must match the load requirements of the equipment the motor will be running at. Those load values are expressed by the horsepower (HP) and the revolutions per minute (RPM). Horsepower is basically the output of the motor’s strength, or, as the technical papers describe it, the rate at which work is done. Horsepower is usually expressed in numeric values from fractional (1/4, 1/2, 3/4, etc.) to whole number values (1, 2, 5, 10, etc.). The base standard of 1 HP is equivalent to 746 watts of electricity generated. RPM is how fast the motor is turning per minute to produce the needed torque and HP. The rpm rated for any motor is the maximum revolutions per minute the motor can sustain without damaging the motor (the full-load speed). Preferably, the motor will be worked at a lower rpm than that rated, so that the motor’s life will be longer. Frame size is the standard for dimensional design. 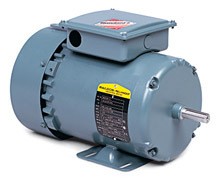 North America uses NEMA standards that range from fractional (48 or 56 frame) to integral horsepower motors (143 through 449, and denoted with a “T” – ex: 143T or 449T). The frame size is determined by the horsepower, speed and enclosure used. International standards use the IEC standards with a range from 56 through 355 and more. Motors come in one of two types: open or enclosed. Open motors are often designated “drip-proof”, meaning contaminants cannot directly enter the motor from a 15-degree angle over the motor. 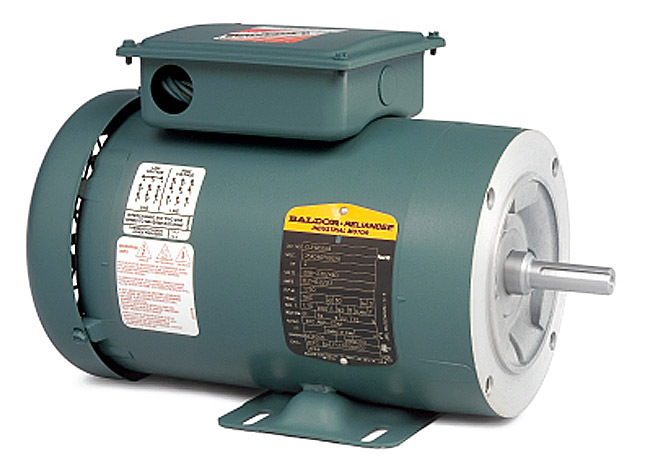 Enclosed motors come as totally enclosed, non-ventilated (TENV) or totally enclosed, fan-cooled (TEFC). There are also various other levels of enclosure such as severe duty and IEEE 841, washdown, hazardous duty, high-performance, and inverter duty motors, as well as a variety of mounting options. This is the electrical power the motor is designed to operate with. Standard voltages in North America are 115/230V, 230/460V, 208-230/460V, and 575V. You must be sure the voltage in your power lines matches the voltage the motor is rated for. If the wrong voltage is supplied to the motor, the motor will quickly burn up and you’ll be needing another replacement. Frequency is the AC (alternating current) value of the electric current coming into the motor. Typically, this will be either 50Hz (European AC power) or 60Hz (North American AC power). If there are additional frequencies shown, you will also find other parameters defined on the nameplate. This is the type of electrical input that makes the motor run. 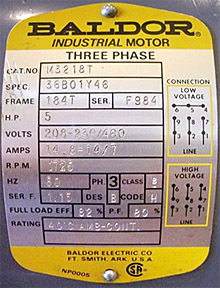 Phase tells you how many power wires supply the power the motor needs. DC (direct current) usually means the power comes from a battery, or other DC power source. If the electrical power coming into the motor is not correctly matched to what the motor needs, you will either not get the level of performance you expect or the motor will burn up. It is very important to pay attention to this information. The nameplate information tells you the exact standards that must be met in order for a replacement motor to provide the power needed to your mechanical equipment. If you can’t find the nameplate on the old motor, go to the mechanical equipment specs for power ratings and motor information. You should be able to gather enough information there to provide you the basic data shown on the nameplate. Now, you find a motor with all those same values. If your equipment is not new, you may also want to dig a little deeper into the additional specs on the motor (sometimes also included on the nameplate). Using the model number or serial number, you can find out the service rating, efficiency rate, and more. Compare those numbers against the same standards in the new motors you are looking at. Once all the basic standards are met, getting the best efficiency and service ratings means your motor will be more energy efficient and provide a more consistent level of performance, maybe even greater longevity.